Today, the E-PROPS design department is composed of 8 aeronautical engineers and technicians. They are doing theoretical calculations, modelling, prototypes development, then experiments on ground and in flight. They have a great experience, recognized by their peers, and are regularly requested for specialized conferences and symposia. 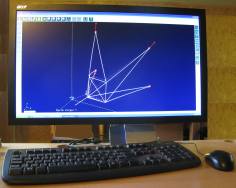 The team uses successful CAD softwares, and have developed an iterative program : LmPTR©. - propeller diameter is limited either by aircraft geometry (ground clearance or fuselage clearance) or by peripheral speed (supersonic issues). To increase number of blades allows reducing lift of each blade. So the induced drag of each blade is reduced. But, with a constant chord, this increases the friction drag. And if chord is reduced, Reynolds number decreases and airfoils characteristics are degraded. Use of small chords also leads to mechanical strength issues. When looking for the optimum load distribution, induced drag must be taken into account. For example, blade tip cannot generate high lift without high induced drag. Chord optimization leads to use each airfoil at best lift/drag ratio, without forgetting Reynolds variation effects and checking airfoil matching to CL conditions (Reynolds and Mach). 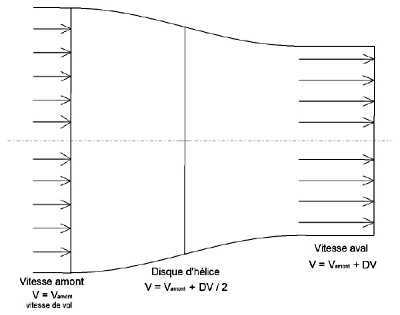 Pitch distribution is used to maintain an optimum lift coefficient to each airfoil in order to get the chosen lift distribution with the optimized chord and airfoil distribution. Linked to this complex process, propeller design is an iterative calculation. 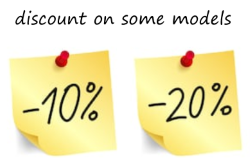 The modification of one parameter leads to change the others. The LmPTR© software has been developed by Jeremie Buiatti, designer of the E-PROPS propeller. Numerical processing and sharpness software modeling allow an efficient design process, able to get the optimum propeller for each flight configuration. 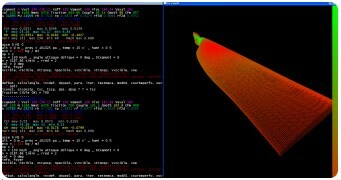 This software performs a detailed aerodynamic flows analysis and a mechanical behavior analysis of the propeller. This software is implemented from an advanced language and contains more than 85.000 code lines. The software implementation was carried out along 5 years of work. LmPTR© sofware is regularly improved thanks to ground and flight tests data on E-PROPS propellers. Tests have also been made in a wind tunnel, during carbon propellers' developments for UAV. These tests are at the moment confidential and cannot be published. They have allowed to verify numerous hypotheses and to enrich the LmPTR© software. This sofware is an asset for E-PROPS; it allows to quickly design propellers right adapted to specific aircraft and engine. Propeller geometrical data are then sent to the numerical control machining center which manufactures the molds and tools. This software allows the team to imagine new propellers concepts, by using particular geometries and profiles developed inhouse. That is why E-PROPS propellers are very different from other propellers proposed at present on the market. 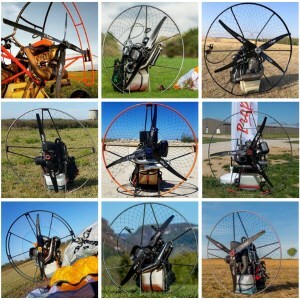 On certain models, 11 innovationscan be found compared with the traditional propellers. Some of those innovations have been patented. The obtained performances are exceptional. Performances are exceptional : some E-PROPS models, ground adjustable pitch, are more efficient than competing propellers with inflight variable pitch. Since the beginning of aviation, propellers did not stop evolving. The 1st generation of propellers for the light aviation was contituted by wooden or metal propellers. In the 1940s - 1950, those fixed-pitch propellers were adapted more or less well to direct drive engines (as Continental, Lycoming, Volkswagen). They were mostly certified. To have a little better efficiency, the only solution was to use some rare variable-pitch, heavy and expensive. In the 1980s - 1990, some composite propellers come on the market. Those propellers were lighter and showed a better efficiency. The ground adjustable pitch system marks a significant step forward for leisure aviation. The 2000s - 2010 have discover the 3rd generation of propellers. Due to mechanical performances of the carbon fiber, new aerodynamic designs become possible : high CL profiles, narrow chords, very big diameters, positions of the blades... The numerical modelling studies allow to optimize propeller's performances on all speed's range of the aircraft. It is possible to obtain the best thrust during all the flight with the same pitch (what is called "ESR effect" on E-PROPS propellers). It is not necessary to choose between "take-off" and "cruise" performances. The constant advances in innovative technologies, design's tools and tests systems let envisage in the next years new progress on propellers. All E-PROPS models are tested in order to bes ure of their performances, of their mechanical strength, and if they match with the engines. Indeed, for each new model, it is necessary to compare calculations and physical reality. Some tests have also been made in wind tunnel, during special developments for UAV. These tests are confidential and cannot be communicated. Many hypotheses have been tested, then enriched the LmPTR© software. Results : safety coefficient = 7,2. The system carbon hub + blade can hold 6 times the maximal load during 1 hour without any damages (EASA CS-P asks only 2 times for certified propellers). Stress the blade with alternating bending, to reproduce the engine's torque, and to establish the real propellers MTBO (Mean Time Between Overhauls). MTBO 2.000 hours validated by tests. These tests results are extremely satisfactory, because they consolidate calculations and modellings of our engineering department by a check in real conditions at 10 times the worse case of functioning. Results : safety coefficient = 4,6. The system carbon hub + blade can hold 4 times the maximal load during 1 hour without any damages (EASA CS-P asks only 2 times for certified propellers). The E-PROPS propellers are certified following the ASTM F2506-13 standards. 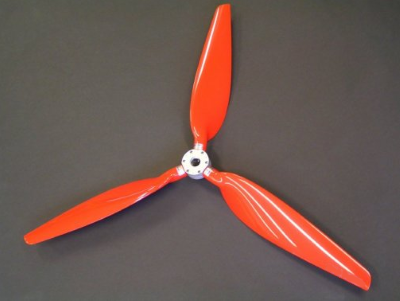 All E-PROPS models have undergone extensive testing to meet this standard. - Test bench with instruments and traction measurement system. - Fatigue tests bench, to stress the blade with alternating bending, to reproduce the engine's torque, and to establish the real propellers MTBO. - Traction tests bench. 40 tonnes hydraulic cylinder. In conclusion : the E-Props Durandal is the better propeller. - Replacement of a 2-blades variable pitch Woodcomp propeller with a 3-blades E-Props Durandal ground adjustable pitch. E-PROPS : same performances as with a variable pitch propeller. Customer feedback May 2017. Thrust 30% more than with the Autogyro 3-blades. is significantly more efficient than the 3-blades variable pitch WOODCOMP. Tests made by the pilots of the Gaz-aile association. Match E-Props / Pennec Variable pitch = E-Props wins ! E-PROPS : better than a variable pitch propeller. Made by a owner / pilot of Europa. "Performances at take-off and climb are better with E-Props than with 3-blades Dyn'Aero propeller"
"Take-off and climb performances with the E-PROPS are better than those obtained with EVRA propeller, and are similar to the performances obtained with a variable pitch propeller ARPLAST PV50 Constant Speed". In 2015, the E-PROPS team has acquired a SKYRANGER ultralight with a 100 hp Rotax 912S. This investment has been made in order to continue testing the E-Props for aircraft and ultralights. 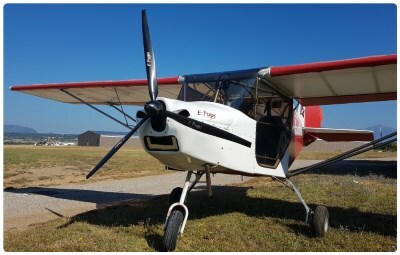 This simple airplane is equipped with innovative instruments (DAU : Data Acquisition System) to record all propellers parameters in all flight configurations. A complex system of different types of sensors and strain gauges is integrated in the propeller's hub, on the feet of the blades, and on other key places of the airplane. During the flight, thousands of measurements are sent in real time via Bluetooth to a computer located in the aircraft, as well as to a display that allows the pilot to refine his flight according to the requested parameters. The obtained results are far more precise and realistic than tests in wind tunnel, and they are obtained in a very short time (during the flight). To obtain the same number of data, this would be needed years of tests campaigns in wind tunnel. Besides, nothing replaces the real conditions of flight. Then data are integrated in the LmPTR© software. This set of tests resources and analysis (airplane + DAU + software) provides innovative and valuable assistance to the E-PROPS design department. In order to understand the propeller operation, it is simpler to perform the analysis at propeller level rather than at airfoil level. First, the third Newton law assess : "If a part A applies a force FA on a part B, The part B applies a force FB on the part A. FB has the same value than FA, the same line of action but the opposite direction". This law is summarized by "action = reaction" principle. If we want our propeller A use a forward force, it must apply on "B" a backward force. For the aircraft, "B" is the air mass going though the blades swept disc. It is not really a mass but a mass air flow. This "mass air flow" is equal to "disc surface" x "air speed" x " air density". To apply a force on the mass air flow, blades are like wings. Blade airfoils allow propeller to apply lift forces on air flow. The propeller applies a force on the air flow so the air flow speed is modified. This speed variation induced by the pull is applied half upstream and half downstream. ==> propulsion efficiency factor is an absolute limit which is the design goal for the propeller designer. Choice of a small diameter for the propeller leads to mediocre performances. And this becomes worst with a low flight speed. Number of blades may allow reducing the performance loss (see after in the text). But this cannot be enough to reach the performances with an adapted diameter. Propulsion phenomenon power losses cannot be decreased by the propeller designer. But he must take care not to increase them with a bad pull distribution along the propeller disc. So he must chose the right pitch, chord and airfoil distribution in order to get the optimum lift distribution. Unfortunately, others energetic losses exist : losses linked to blade drag. Blades are like wings and generate lift and drag. This drag consists of 2 parts : friction drag and lift induced drag. Blade case is more complex than wing one, because speed is variable from foot to tip of the blade. High speed and very small chord => Reynolds number remains small. But as the speed is close to sound one, Mach number is high. High Mach leads to airfoil characteristics degradation. With a small curvature or incidence defect, airflow may become supersonic and so generate noise and degrade performances. The wing has a finite span and so lift generate induced drag. Air speed is constant along the span. Induced drag can be calculated easily at wing level. 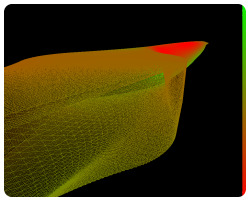 For the propeller blade, induced drag modeling is not easy because of the variable speed along the span. For this drag assessment, Helices E-Props engineers don't find adapted calculation method in specialized press or in labs studies reports. So the team has implemented a new and efficient calculation method. Calculation duration is quite long : 90% of the airflow modeling duration is used to define induced effects on blades linked to iterative documentation. 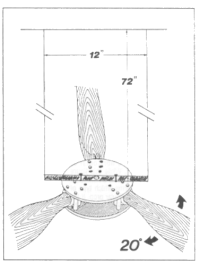 This chapter has listed causes of propeller propulsion energetic losses. 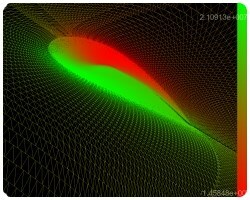 Trigonometric aspects of the modeling have not been presented because they are out of scope of this simplified explanation of the modeling process. The inertia of an object is its capacity to resist a variation of speed. The slowness is directly connected to the mass of the object and thus confronts in kg. 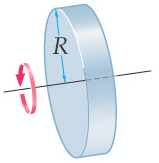 For rotating objects, the mass is not a sufficient information. The mass of the object is associated with its distance by report the axis of rotation, in order to compare the capacity of resistance with a variation of angular speed. It is the moment of inertia : MOI (in kg.cm²). The moment of inertia is a very important data for the propellers. Indeed, the aeronautical engines are mostly piston motors. The brace undergoes a push of the connecting rod in every tour in 2-strokes engines, and both tours in 4-strockes engines. The brace is accelerated during an about-turn, and is slowed down during the rest of the cycle. It is the inertia of all the rotary set which is going to allow to assure the rise of pistons and regularization of the rotation. The propeller makes the biggest steering wheel of inertia. If it is pulled by a reducer, the points of engine torque will be supported by the reducer. If it is directly bound on the brace (for direct drive engines), this one will support all the efforts. The efforts are besides passed on through all the system: the braces of redrive engines can also suffer if the moment of inertia of the propeller is too high. And the screws of the propeller are submitted to the same efforts. 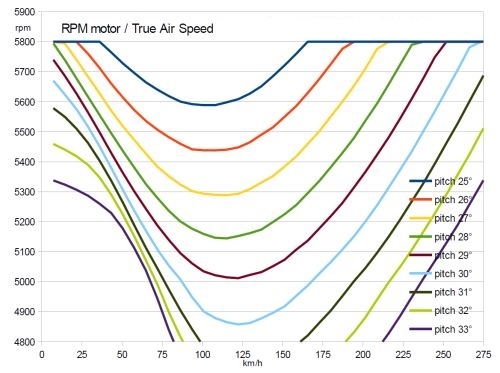 Using of a propeller with a moment of inertia upper to the values indicated by the engines manufacturers is going to decrease of the longevity, even to break the reducer or the screws of the propeller. That's why the engines manufacturers indicate the maximum values of moment of inertia of the propellers which can be adapted to their engines. Be careful : in case of problems linked to the use of an unsuitable propeller, with a too high moment of inertia, engines manufacturers may refuse any guarantee. The E-Props moments of inertia are calculated when the propellers are designed. Then the data are verified and measured for each propeller. It is important to know the moment of inertia of the propeller, and verify that this MOI respects the limitations of the engine manufacturer. The procedure is in the ROTAX technical document ref SI11UL91E. 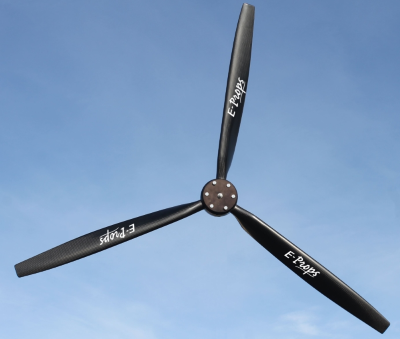 The E-Props are the world's lightest propellers, and have a very low moment of inertia. Symposium organized by association INTER ACTION (Association de Sauvetage Créatif du Savoir Aérotechnique), IUT de CACHAN (French School) and association AERODYNE (Association d’Etudes & Réalisations en Optimisation Dynamique & Energétique) every 5 years near Paris. Subjets : leisure aviation and technique. In 2016, this symposium took place on 10 and 11th of June. Jérémie Buiatti, designer of the E-PROPS propeller, has presented a publication concerning what happens between engine and propeller.